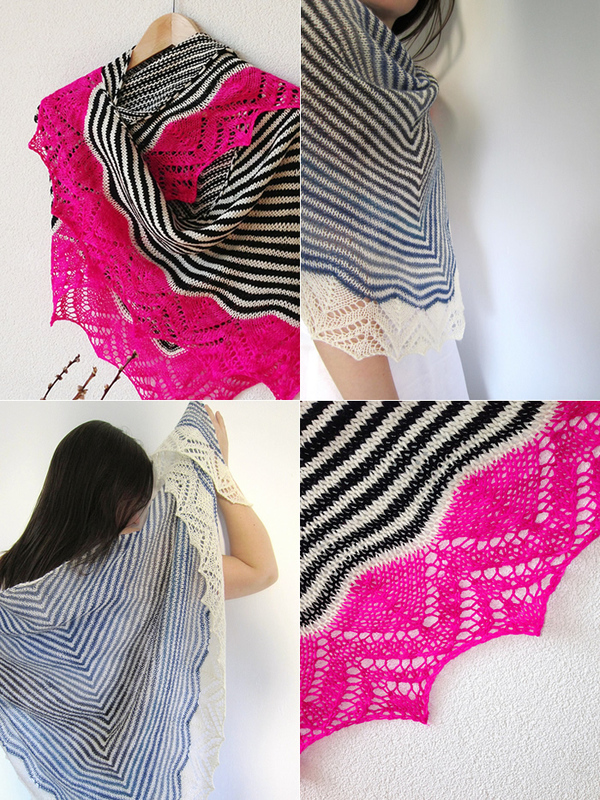 Dream Stripes by Cailliau Berangere is a beautiful triangle shawl knit top-down in stockinette stripes and ending with a simple lace border. This kind of pattern provides a perfect platform for expressing your creativity with colour and texture and begs to be personalized in inventive ways. A quick browse of the finished versions of Dream Stripes on Ravelry (there are 1982!) will give you an idea of what I mean – everything from clear solids and bold variegateds to colour-shifting and subtle tonal yarns are used. From silk, merino, and alpaca to mohair and every blend in between. And from lace to worsted weight yarns. Note: Pattern is available in 8 different languages! New store sample: Unicorn Stripes! Blue Sky Alpacas Sport and Melange now on sale!